Cadbury has upset some fans of its Fruit and Nut bar by adding sultanas to the recipe as well as raisins. After 90 years in production, the firm said sultanas had been included "to add more variation" and "ensure it's still an affordable treat". But some chocoholics accused Cadbury of putting cost - sultanas are cheaper than raisins - ahead of taste. Cadbury came under fire earlier this year when it altered the recipe for its Creme Eggs. The packaging for Fruit and Nut will not change, and Cadbury said that in tests, only 10% of people could tell the difference between the old and new versions. In a statement, it said: "While raisins have actually traditionally been the 'fruit' of Cadbury Fruit and Nut, sultanas have been brought into the fold to add more variation. "It's important we have a flexible supply of the dried fruit we use in our famous Fruit and Nut bars to both retain quality and ensure it's still an affordable treat." But some customers took to Twitter to vent their anger at the change, which will appear on the shelves at the end of November. 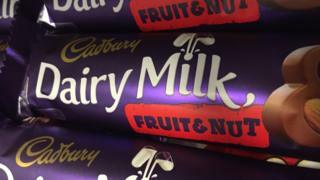 One user Simon Barry wrote: "I hate Cadburys for changing the fruit and nut. Damn the American ownership ruining perfectly good sweets!" Another, Ria Gregory, wrote: "Actually disgusted Cadbury's would think it's OK to put sultanas in Fruit and Nut."